Singing has an infinite power to open the doors of the heart. A waking call on this earth. Songs from the ancient Hebrew language - To new languages that will be channeled live throw us. We invite you to a ceremony of healing with the open heart. Every song is an invitation to create a deeper connection with our heart, soul & our unique path on this earth. Netanel Goldberg (vocal artist, composer, creator, writer, tiller of the soil, Lover & a student of life) is a countertenor vocal artist who leads sessions of prayer and healing circles in Israel, Europe, and the United States. 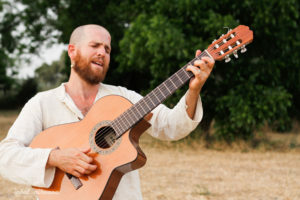 In addition to Hebrew and English, Netanel performs in new languages that he channels live, an improvisational reflection of life through music. In the last past 2 years netanel joined the international guitarist “Estas tone” for tours in Europe, Russia & Ukraine. And tours with the pianist “Mitsch Kohn” in Europe &amp; Israel. In addition to concerts, netanel leads workshops & retreats. he leads & accompanies ceremonies of life (weddings, birth & death). You can listen to his music on his albums, “River of Light”, “Pure Emotion” and the latest “Magic moments” with the mystical pianist Mitsch Kohn. With netanel there are some wide colorful musicians (harp, violin, cello & percussion). On the concert “River of Light – Ceremony of the holy soul” will join him Kalyan A cellist and multi-instrumentist. He has been teaching the art of listening for over 20 years in Canada and Europe. musician and the listener become one. Only listening remains. Netanel lives in Israel with his wife Anva.